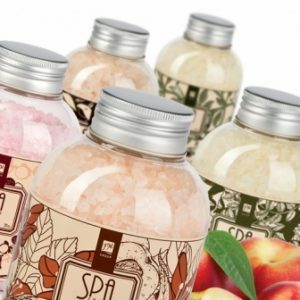 Enjoy a glorious spa treatment at home with our blissful baths salts made with the finest natural ingredients. Natural sea salt from the coast of Brazil, rich in calcium, magnesium, bromine, iodine, potassium and iron, strengthens the skin and makes it more elastic. Wonderful relaxation in a fragrant bath. The essence of a SPA hidden in beautiful packaging. 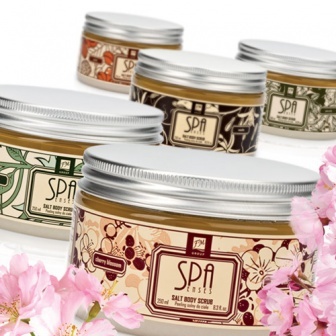 Available in 5 different fragrances: Verbana, Peach, Cherry Blossom, Vanilla and Patchouli. Fresh citrus scent that reduces fatigue, relaxes, soothes the senses. Sweet, juicy aroma, that adds optimism. It’s a real scent of summer. Sunny scent of joy associated with early spring. Its subtle captivating aroma relaxes and brings good mood. In Japan cherry blossom is a symbol of passing beauty. A real sweetness of the tropics. Its warm balsamic scent helps to regenerate strength. Pleasant spicy aroma that relieves stress and refreshes. This scent is especially recommended for men. Special Savings! Buy 4 and get 1 FREE! Brilliant gift choice for your friends and loved ones. Exfoliating body scrub to gently encourage circulation and cell renewal. Salt crystals gently cleanse and smooth the skin to make it velvety smooth and pleasant to the touch. Mild oil moisturises and nourishes your skin to pure silkiness.